I’m joining Diana at Elephant’s Eye in her monthly “Dozen for Diana” meme. Our friend Donna in New York is calling hers “Simply the Best“, I’m calling mine, “My Garden of Twelve“. So I’ve known about this for a few weeks already and honestly, I’ve started my post for it four times! 4 times I started and four times I deleted. I just couldn’t get it right or feel any real passion for the plant profiles I was trying to do. Then I read the brief again. What does she really want us to do? “1. I would like you to imagine a new empty small garden: Perhaps an enclosed courtyard? The view from a window? That new garden bed? 2. Choose Twelve plants that grow happily in your climate and soil! Make a list tailored for your garden. 3. Diana favours indigenous/native for wildlife. She also has roses. What do you like? What works in your garden? Right, now I get it. Only, I don’t have to imagine an empty bed. I have one. A recently stripped bed. Its been stripped, composted, mulched, watered, left. It’s ready for some planting action. I have no plan. So lets use the bed and make a plan. 12 plants. 12 months. 12 progress blog posts. Size of the bed: 3,2 metres long, 2.1 metres wide. Aspect: East facing, against my west boundary wall. Full sun / partial shade under the Birch tree. • A Birch tree, fair size. • A young ornamental cherry (could be moved). • A few random plants (Carex, Helichrysum petiolare, Lamium) that may be moved to other areas in the garden. Or not. Desired Style: My own. I’ll work it out as I go along, but I’m thinking roses and grasses … perhaps. I can have 12 plants. And they need to work. Name of the bed: For now I’ll call it my garden of twelve. Intended plants: 12 plants. 12 that work. 12 plants that I love. 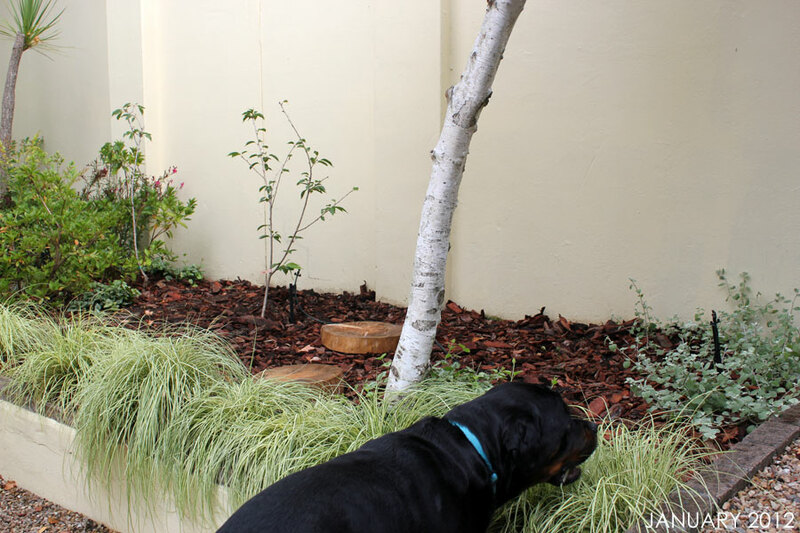 Problems / special considerations: My pets often walk in the front part of this beds so plants situated at the front cannot be delicate or fragile. Right, it’s nothing very exciting, terribly exotic, prestigious or even desirable. But I love it! Why? I took a walk around my garden and asked myself the question … “If I pulled out every single plant and started from scratch, what is the very first plant I would plant again?”. In my garden, its Carex evergold. I just adore everything about this hardy plant. I know its not indigeneous, spectacular, bla bla bla … but it makes me happy and makes me want to be in the garden. So if I have these, then the rest follows. In my garden of twelve, they already exist from the previous planting. As you can see in the photos (of the bed, above), they are planted all in a row – my rookie mistake. I plan to remove a few, then reposition the rest to create a more natural look. staggered, perhaps with a low growing, flowering ground cover in between, or something else, we’ll get to that … this is the First of my Twelve! Growth habit: It is a fairly dense, clump-forming sedge grown for its foliage effect. Leaves: The leaves are grass-like, arching and variegated (creamy yellow with dark green borders). Problems: To date I am not aware of any problems with Carex in my garden. I’ve lost one (a newly planted one) to what I think was cutworm. Other than that, they are easy, low maintenance, with a nice mounding growth habit. It is not spreading itself in my garden so is very well behaved and a bonus is that it can take a fair amount of abuse in terms of my pets trampling on it – which they like to do! 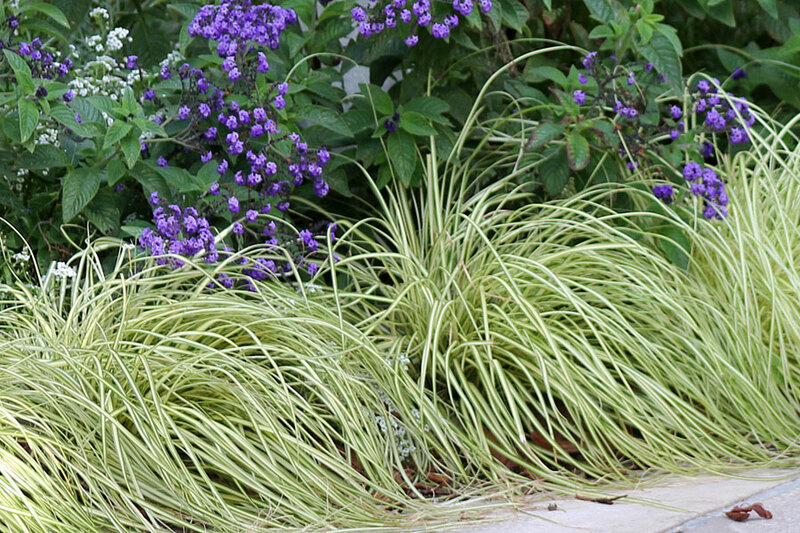 Seasonal interest: Carex is evergreen here in my climate, and looks great in all seasons with no colour changes. References: Some information from the Missouri Botanical Garden, the rest is my own observation and experience. 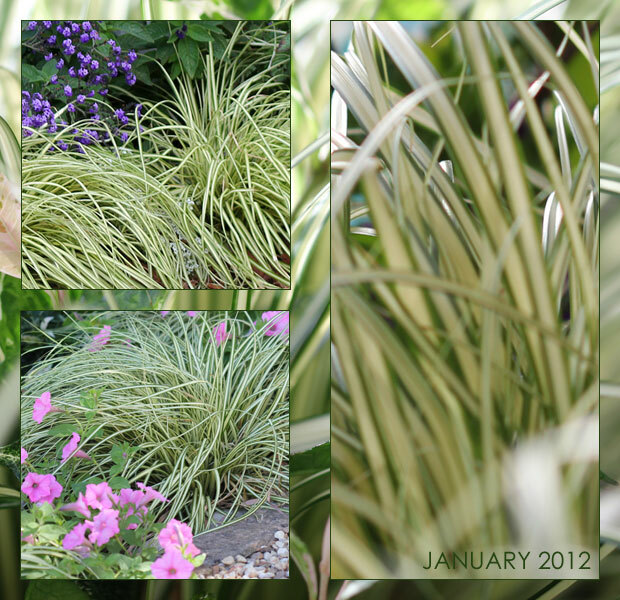 My Garden of Twelve by Month in photos (Starts January 2012). For a list of good memes, see our list at Gardening Blog Memes. loved following your thought processes – seems like you have a very ordered mind too. 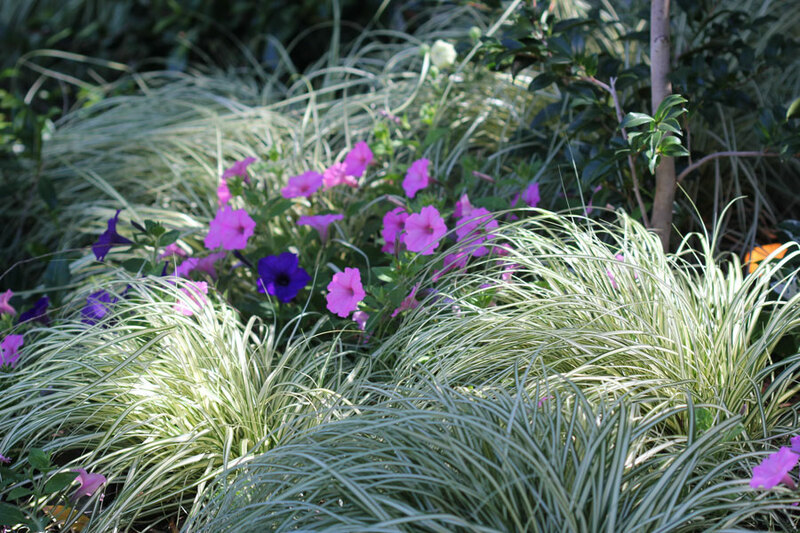 Carex is a beautiful plant in itself but anything that is shade tolerant is a plus too. Like the fact that you have not splodged one or two around but made a statement with them. Think mine has a touch of rust though this year. Hello Christine. I just love Diana’s meme and will enjoy following along. I would like to believe that I would commit to writing a post on this topic each month; perhaps I would. My signature plant, although it makes no sense at all (because it blooms only a few weeks) is peony – any peony – all peonies. I adore them. I really like your sedge and will look into adding it to one of my gardens. I don’t own one currently. This is such a great idea for getting “that new bed” into gear. I have a few of those in my back garden. Good luck and I know that it will be just beautiful!! What a great way to approach this meme! It will be a treat to see your “Garden of Twelve” come together! I think you are approaching it in a wise way–starting with a plant you love and one that forms a nice foundation for other plants to come. Cheers! What an excellent choice! 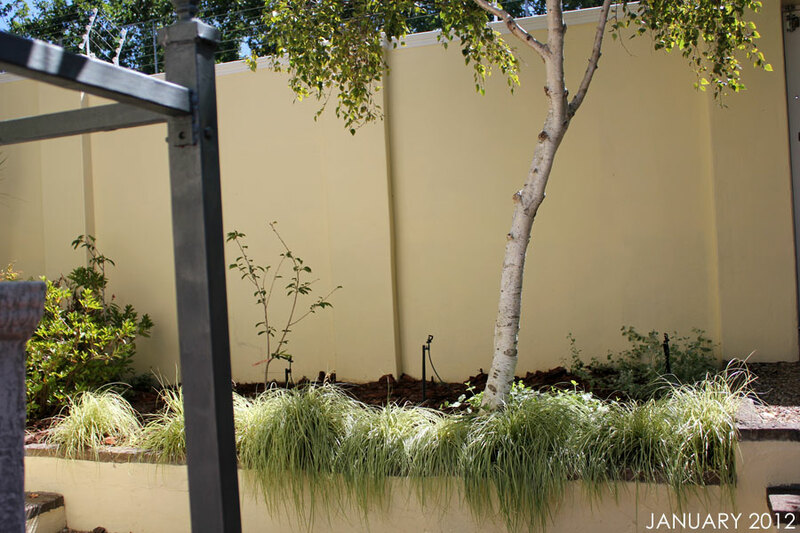 I think this sedge is an eye-catcher – both in texture and color-interest. Variegated plants have always been a big draw for me, especially in part-shade areas (which I now have a lot of). This meme has a great theme – not a surprise that you were inspired by Diana and Donna; you all are very inspiring to the garden blog community! Christine, I enjoyed your article! 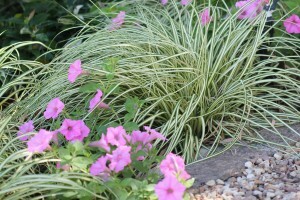 Maybe, I need to think about my favorite 12 plants… I love Carex. Started to plant it only several years ago. It looks great even now, after being under the heavy snow that hit us on Wednesday. Isn’t it wonderful to have a plant that you love so much you always want it in your garden? One that makes you happy and the one you think of first when thinking of planting? Great first plant for your 12! I can’t wait to see your bed being rejuvenated and re-done! 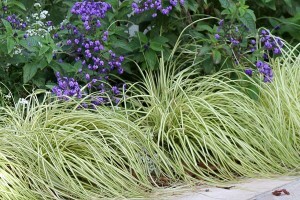 I have many carex in my garden and it is a fine plant, offering great garden texture. It lives in a variety of garden conditions too. I too like your image on image mosaic. It is a nice feature to have it in a post. The rush and sedge fill in those bare areas so nicely…besides adding texture. Although I have favorites, I think a garden spot sometimes dictates what I may plant. And I like experimenting as well. PS I love the collage with cooordinated frame. That was a trick Jan at ThanksforToday taught me. Always reminds me of her. Thanks Jan! Hehe, and I copied yours! I thought it will be nice to have at the end of the 12 months. Yes! 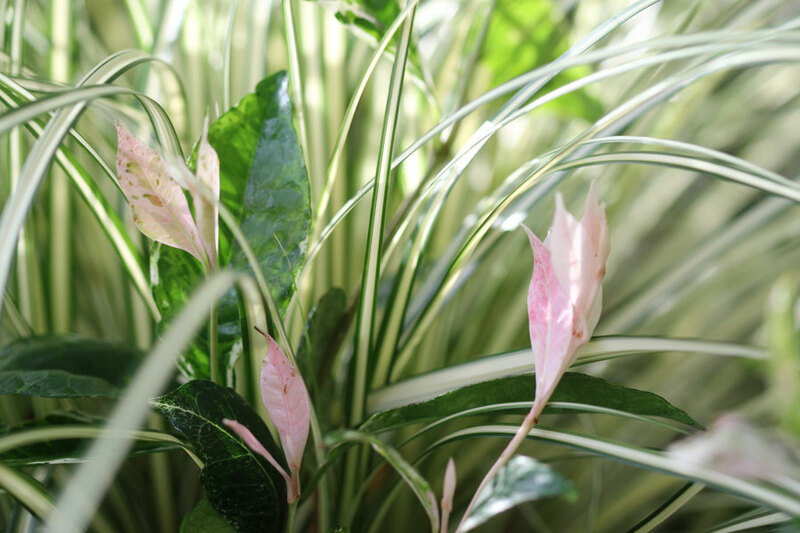 You love it, it likes your climate/soil/garden, gives year round textural interest and variegated leaf colour. Ticks four boxes. 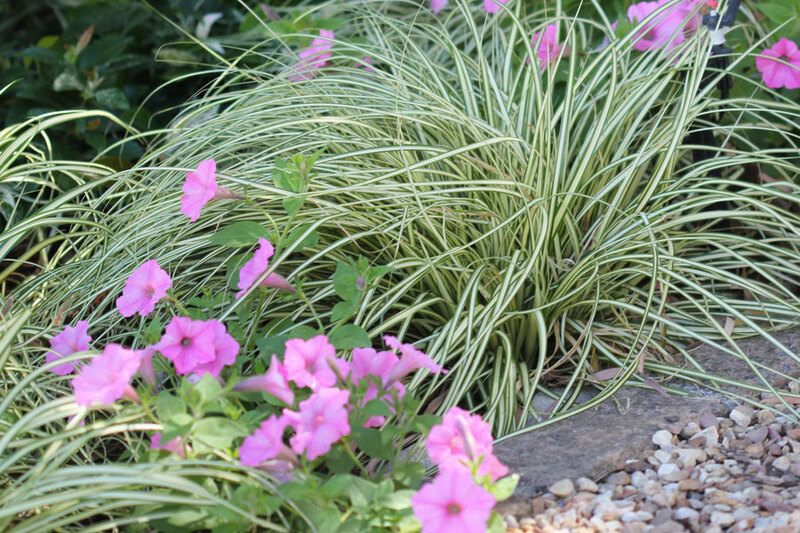 Would you call this Carex your signature plant? Or will you get to that later in the 12? I have one lurking under the Plectranthus, which is in its grumbling about this HEAT mode. Come March I’ll move the Carex, maybe divide it? Liriope has a similar effect, but slightly wider, fleshier leaves, and seems to deal with my heat better. Christine, I absolutely adore this sedge and have it in my garden although not as many as you have…great start and thx for the shout out! !